It was quite a few months ago that Google launched an updated, renamed keyboard app for iOS, and the Mountain View company has finally got around to releasing the same app for its own mobile operating system. Gboard (the app formerly known as Google Keyboard) is now live on the Play Store and can be yours completely free of charge. Those of you running stock Android devices (like the Pixel) should already have it. 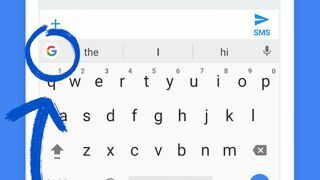 Among the new features now available in Gboard are a revamped user interface so you can access those emojis quicker than ever before, as well as integrated Google search if you need to look something up on the web. The example Google gives is when you're trying to text a friend the address for a restaurant - thanks to Gboard you can find it straight from the keyboard without having to jump out of the app you're currently in. You can now search through GIFs and emojis to save yourself some scrolling, and Google says the app has better multilingual support now, as well as some improved AI smarts to nail those autocorrect options each time. That's on top of all the goodies that were already available in Google Keyboard: support for animated GIFs, Glide Typing (where you don't need to lift your finger) and the option of voice input if you prefer that to pecking away at the screen.